Allows easy access to frequently used lists, charts, schedules, etc. No pin policy in your office? 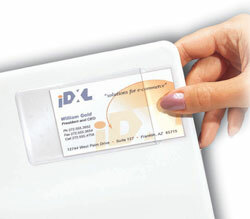 Organize and personalize your cubicle with sturdy, super-clear polypropylene holders. Repositionable Velcro-backed holders grip office panel walls to display phone lists, photos, certificates and more. Allows easy access to frequently used lists, charts, schedules, etc. For vertical or horizontal display. Economy pack. 25/BX. Hi. I'm John at C-Line and today we're going to talk about our Cubicle Keepers for Fabric Surfaces. These handy pockets with hook and loop fasteners let you display information on fabric surfaces throughout your business, warehouse, school or home, wherever you need it. The hook and loop fasteners grip fabric walls and eliminate the use of destructive push pins, tacks, tape and permanent adhesives. Cubicle Keepers can be used vertically or horizontally and are easy to apply, reposition and remove. They provide a great option for displaying checklists, schedules, phone numbers, photos, and much more on fabric walls. And they work great in office cubicles. Post information where you need it with C-Line's Cubicle Keepers for Fabric Surfaces. Order yours now! That's all we have for today. I'm John with C-Line. Thanks for watching.